Every once in a while, you hear of a town that exudes the meaning of "Small Town, USA". Harrison, Arkansas is that town. Because of its beautiful scenery and outdoor attractions (as well as being between Branson, MO, and the gorgeous Buffalo National River), Harrison is an ideal location to stop and stay, and of course EAT. At Western Sizzlin, we want to be part of your next trip! We have taken extra steps to ensure we are a bus-friendly restaurant for large groups. We have large, special parking for buses with plently of room to park. We also accommodate groups with twenty or more people by providing the driver and the guide/coordinator with a free meal! Yes, we give two free meals to you for letting us feed your group. We are also equipped to accommodate sports teams or other large clubs and groups. We can provide special meal orders, back door entry for expedited service, and we can send your bill directly to your school or business for payment! 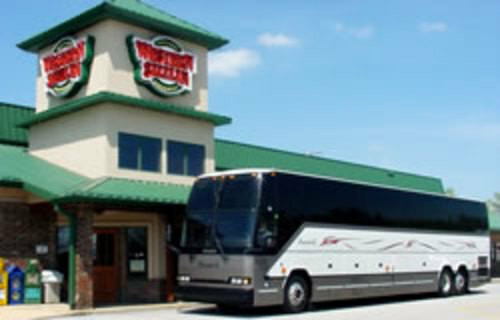 Call now to make a reservation for your group at Western Sizzlin!